This beautiful home sits on a huge 13.93-acre waterfront lot on a quiet cul-de-sac in Ravens Bluff. 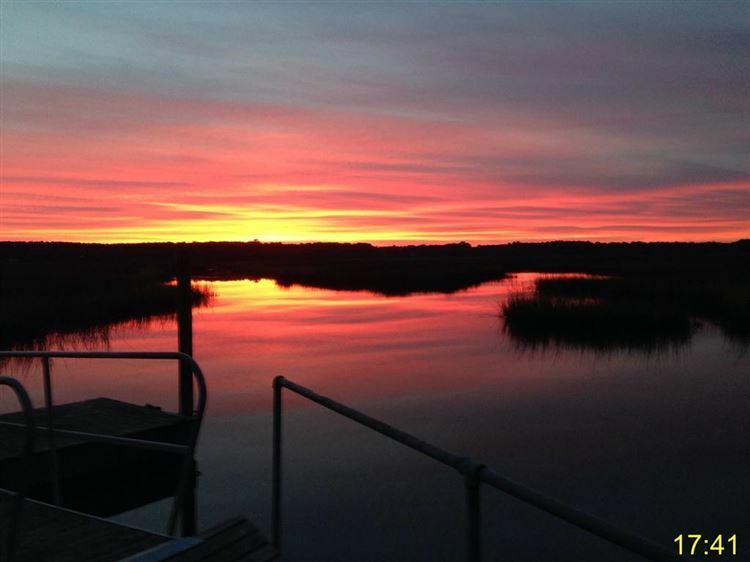 The property offers stunning views of the Stono River, with a 4 mile view across the river. You'll also enjoy seeing wildlife and gorgeous sunsets. The three-car garage gives you plenty of space for parking and storage. The large wrap-around porch welcomes you home. As you enter, you'll be greeted by Brazilian cherry wood floors, soaring vaulted ceilings, and a spacious open floor plan, with floor to ceiling windows, providing an abundance of natural light and amazing views of the marsh and river. The formal dining room could also be used as an office. Enjoy cool evenings in front of the cozy gas fireplace, in the great room, where you will also find built-in shelving. The gourmet kitchen boasts stainless steel appliances (including an 8-burner Viking gas range), granite countertops, a large butler pantry (with 2 built-in wine fridges), and a dining area, with lots of windows, overlooking the beautiful backyard. Refrigerator and wine fridges to convey, with an acceptable offer and as part of the sales contract. The spacious first-floor master bedroom features outside access to the screened-in back porch, a large walk-in closet, and a luxurious en-suite, with skylights, a dual vanity, a beautiful claw-foot soaking tub, and a large walk-in shower. The rest of the bedrooms are also spacious in size. The finished room over the garage could be used as a guest suite, converted into a mother-in-law suite, or it would also make an excellent game room or entertainment room. Enjoy your morning coffee from the screened-in porch, overlooking the beautiful backyard, marsh, and river. It will be your new favorite place to relax. The patio, in-ground pool, and large backyard, will be perfect for grilling out, entertaining, or watching the kids play. There is also a fenced-in area of the backyard, with a privacy fence. This huge property could allow for horse or future construction, if desired. Conveniently located near shopping, dining, Downtown Charleston, and area beaches. Come see your gorgeous new dream home, today! I am interested in more information about 1494 Ravens Bluff Rd.